Love salmon as much as we do? 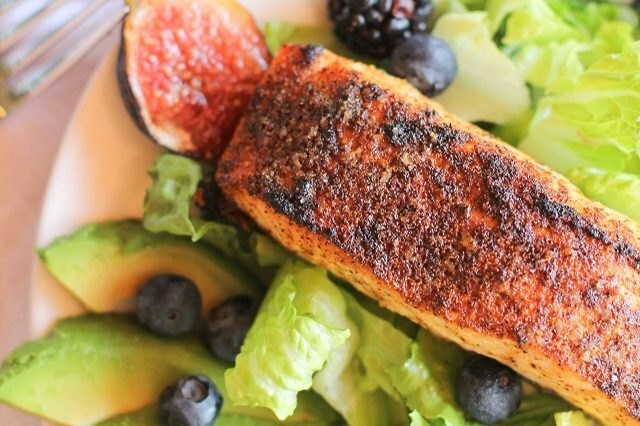 You might also like How to Perfectly Grill Salmon With Its Skin On, How to Bake Salmon in the Oven, and this delicious Pistachio Crusted Salmon Recipe. Preheat the oven to 375 F, and spray an oven-safe cooking dish with oil. 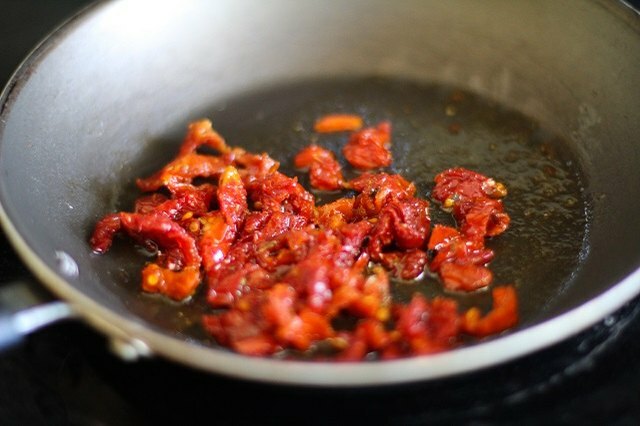 Use a paper towel to dab some of the oil from the sun-dried tomatoes before placing them on a cutting board and chopping them. 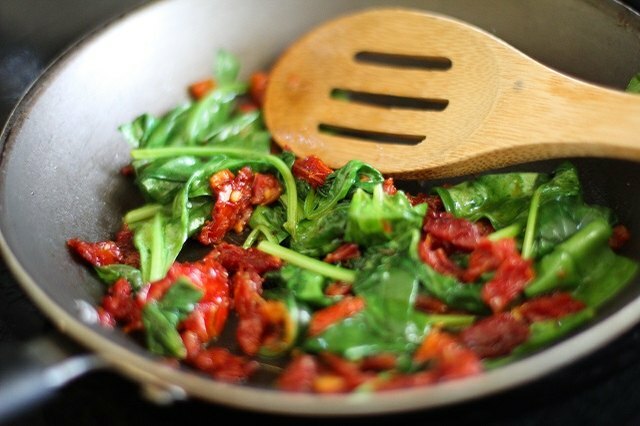 Add the oil and chopped sun-dried tomatoes to a skillet over medium heat. Cook for 1 minute, stirring occasionally or until fragrant. 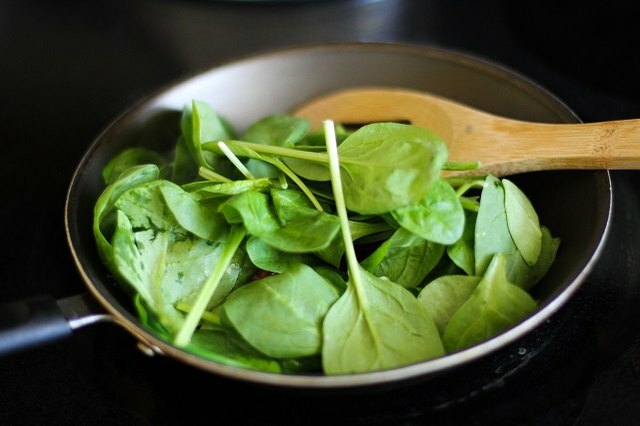 Add the baby spinach and chopped basil leaves to the skillet. It's OK if the skillet seems very full -- the leaves will wilt and cook down. Stir occasionally until the leaves have completely wilted, about 3 minutes. Turn off the cooking element, and remove the skillet from the heat. 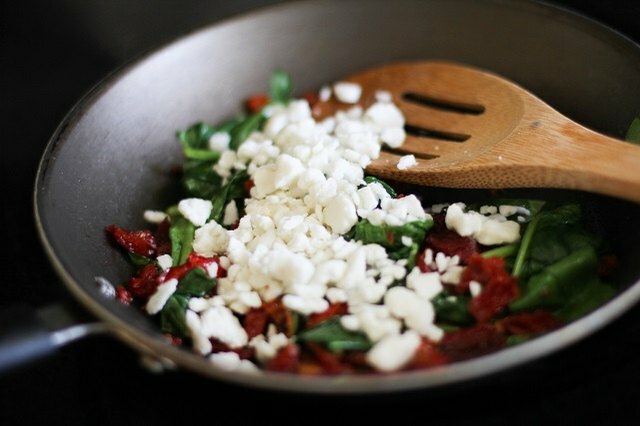 Add the feta cheese and stir until well combined with the other ingredients. 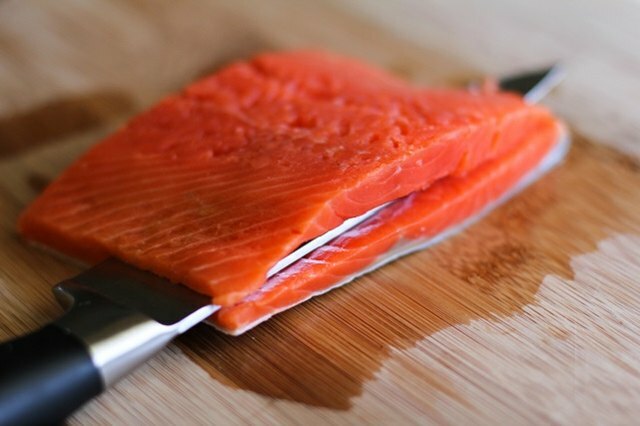 Place salmon fillets (or fillet) on a cutting board. 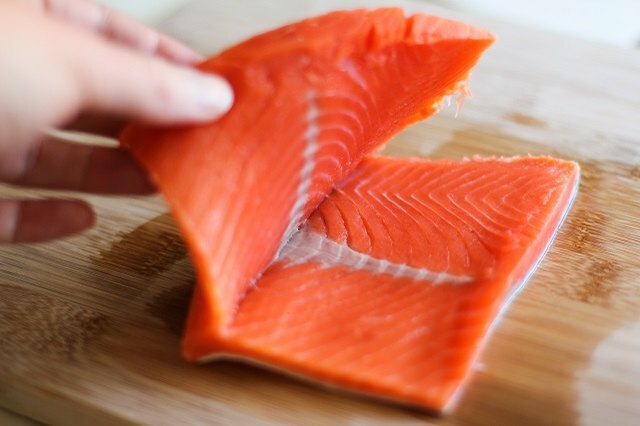 Use a sharp knife to carefully slice the salmon through the center, just until the knife almost reaches the other side. It's OK if you cut all the way through the salmon fillet. You can still stuff it by placing the slices one on top of the other. 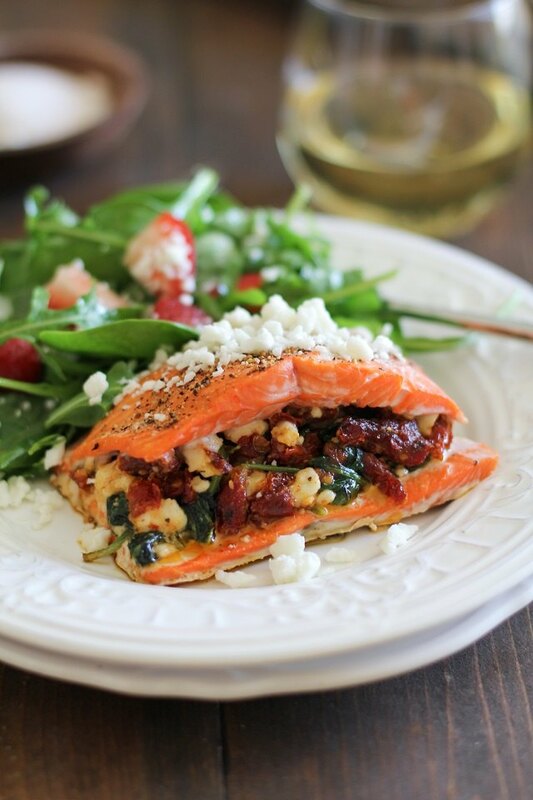 Use a large spoon to distribute the stuffing into the centers of each of the salmon fillets. 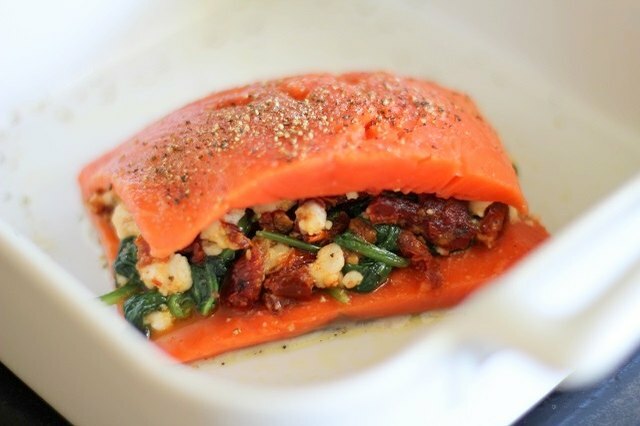 Carefully transfer the salmon fillets to the prepared baking dish. Sprinkle with salt and pepper. 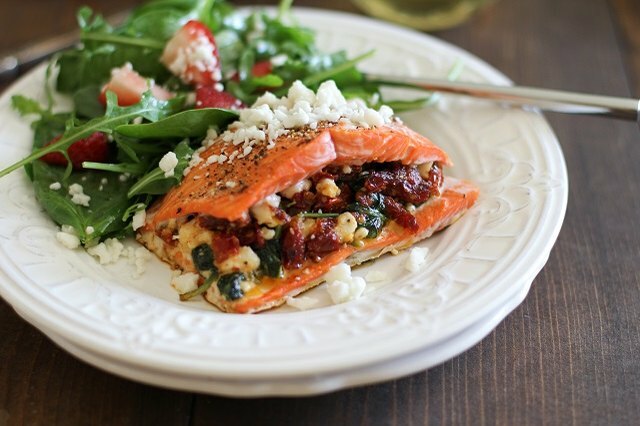 Bake salmon on the center rack of the oven for 20 to 30 minutes. If the fillets started out thinner than 1 inch, it should take 20 to 25 minutes. Salmon fillets that started out thicker than one inch will take closer to 25 to 30 minutes. Remove from oven, and use a spatula to serve alongside your favorite side dishes. Replace the basil with fresh sage, thyme or parsley. 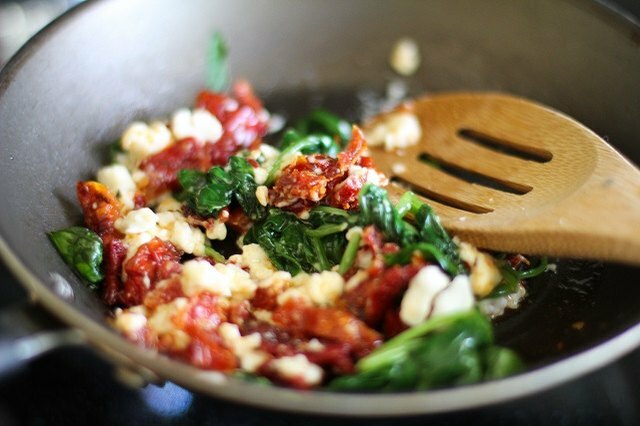 Include 2 cloves of minced garlic, and saute with other veggies until softened. 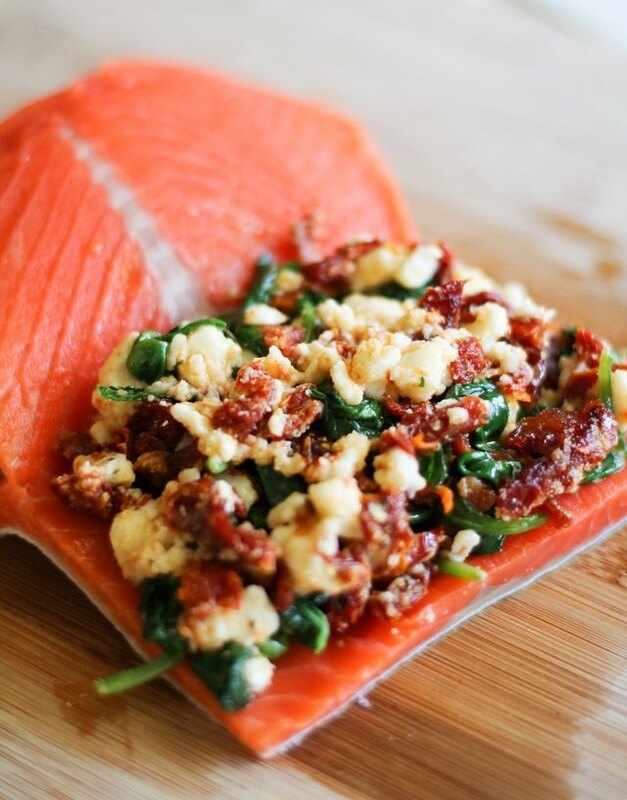 Atlantic, sockeye or king salmon work well with this recipe. As an alternative, try halibut. 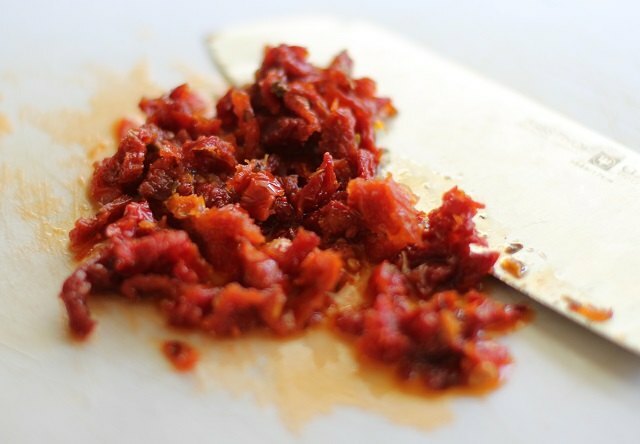 Replace sun-dried tomatoes with halved cherry tomatoes. If using cherry tomatoes, increase measurement to 1 cup. Add dried seasonings and herbs such as rosemary, oregano, thyme, basil, Italian seasoning or Herbs de Provence. Stuff the salmon with a homemade crab or shrimp salad. Serve with lemon wedges, or drizzle fresh lemon juice over the dish before serving. Sprinkle feta, goat or Parmesan cheese over the fish before serving. Serve the dish with a green salad, quinoa salad, baked potato, steamed broccoli or roasted asparagus.